Detail from Cut and Cover, oil on canvas, 2014. Pentimenti are traces of changes in design or composition made by the artist during the process of painting. 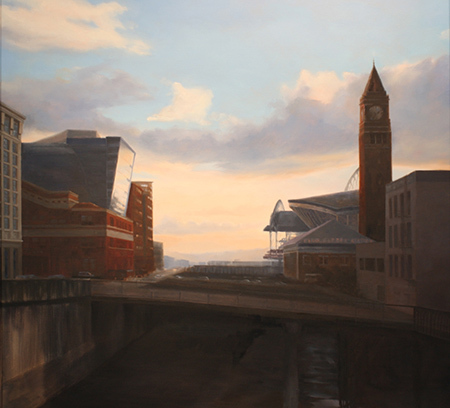 The Northwest landscape has been significantly recomposed as each generation pursues its current vision of progress. This series explores the changing relationship between humans and our environment, our evolving definitions of progress, and the stories we tell ourselves about it. I am influenced by the technical virtuosity and transcendent luminosity of romantics such as the Hudson River School painters, whose amazing depictions of natural wonders became the face of manifest destiny and America’s expansion to the Pacific. But my landscapes necessarily reflect contemporary interventions in the natural world, as seen by a contemporary eye. University Unitarian Church has a distinguished history of art exhibits and support of art and ideas. I am honored by this exhibition of new and recent work in their Chapel space. Please join me for an opening reception Sunday, September 7th from 1 to 3 pm. This work was made possible in part by a grant from Artist Trust. This entry was posted on Monday, August 11th, 2014 at 4:05 pm	and is filed under art. You can follow any responses to this entry through the RSS 2.0 feed. Both comments and pings are currently closed.